As cat owners, we’ve all had the unpleasant experience of getting out of bed and stepping into a cold puddle of nastiness left by our cat. It’s practically a rite of passage to accidentally step on a hairball or two. But while they are common, there is a lot about the the topic of hairballs that may surprise most cat owners. While hairballs are common, they’re actually not “normal.” To understand why, let’s look at how they’re formed. A healthy cat will spend much of their time grooming themselves, and in doing so, will remove and swallow loose hair. This happens because their tongues are covered with hundreds of little backwards-facing barbs that grab hair and carry it into the digestive system. For most cats, this swallowed hair passes naturally through their system (and out the other end) without issue. However, some cats will collect so much hair in their digestive tracts that it causes an obstruction which can be expelled in the form of a hairball. These hairballs are often caused by ingesting excess amounts of hair through overgrooming (common with skin conditions, painful areas, or stress) or by having trouble moving the hair through their system (which can occur with gastrointestinal diseases or certain medications). A hairball actually doesn’t really look much like a ball at all. In fact, “hair sausage” might be a better visual description, as hairballs are long, dense, tubular bundles (typically about the width of a thumb). The reason for this distinctive shape is the way in which hair accumulates and wads together in the stomach. Plus, it’s a lot easier for it to pass out of the stomach in the shape of a cigar than a round ball. Many owners confuse hairballs and other kinds of vomit, and it’s easy to see why. When they vomit, cats get into a recognizable crouch position (with their necks extended and their bodies low), and make “expulsive” sounds. And, let’s face it, it’s an experience you’re not likely to forget as a cat owner. However cats do this when they vomit for any reason, and if they have been grooming themselves there is almost always some hair mixed in with the vomit. But just because there is hair in vomit, it doesn’t mean it’s a hairball. How can I tell the difference between a hairball and other kinds of vomit? The primary way you can tell the difference between vomit and hairballs is the ratio of hair to other material. A hairball will be a cigar-shaped tube of densely packed hair – with some digestive fluid around it. Conversely, vomit will be primarily fluids, bile, undigested food, and/or other materials – with some hair mixed in. 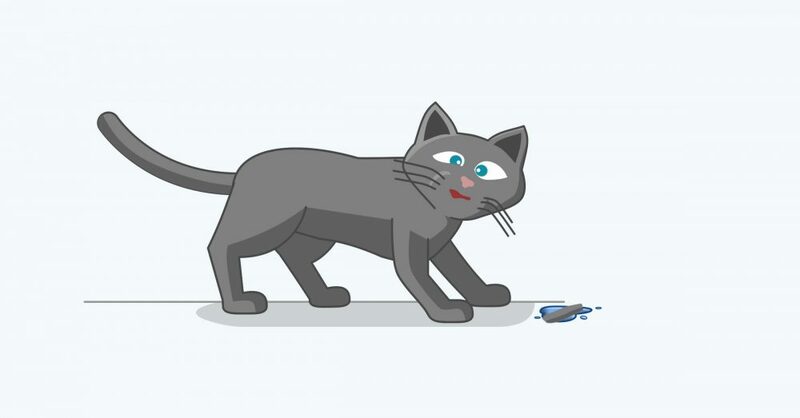 Speaking of vomit, what many people don’t realize is that cats assume almost identical positions – and make almost identical sounds – when they cough and when they vomit. Unfortunately, this leads many owners to ignore coughing in their cat, because they see it as “oh Fluffy’s just trying to cough up another hairball.” This can be problematic to ignore, as the coughing could be a symptom of a more serious medical issue, such as respiratory disease. One thing to remember is that cats are very efficient vomiters. So, if they have something in their stomachs that they need to get out, they will. So, if nothing is coming out, they’re more likely coughing than “trying” to throw something up. Another common experience that many people confuse with hairballs is a cat’s early morning ritual of making retching sounds, and then spitting out puddles of liquid containing small tangles of hair. This tends to happen most often in the early morning when cats start to become active, are thinking about eating, and have an almost empty stomach. And while this may contain liquid and hair, in many cases, cats that do this are suffering from acid indigestion, hyper-acidity, or bilious (nauseous) vomiting, and would need to be treated as such. Should I be concerned about my cat’s hairballs? As they are caused by excessive amounts of hair, regularly grooming your cat to remove loose hair will go a long way towards preventing hairballs. If your cat won’t sit still for you to comb them, booking regular appointments with professional groomers (either for a comb-out, bath, or haircut) may be helpful. Ensure your cat stays hydrated, by making plenty of fresh water available to them. There are a number of other treatments on the market – for example, hairball diets, gels, and fiber supplements. None of these are scientifically proven to be effective, but some cats do seem to respond to these options. What’s the best way to treat hairballs? If your cat passes a hairball and seems to be doing well otherwise, no treatment is really needed. In this situation, the best treatment is taking the steps above to prevent hairballs from happening again. However, if your cat is having more regular hairballs, it’s best to consult your cat’s vet for a personalized treatment plan.